Mina is finally home and has received an invitation to Grayson’s demonstration of the resonator. Lucy is avoiding the sun, telling her mother she isn’t feeling well and insisting on not seeing any doctors. Mina goes to see Harker to give him back his mother’s cross necklace, but Harker does not want it back. Harker tells Mina how Grayson ruined his life and career, and that he has done some vile things. Mina cannot swear that she doesn’t love Grayson. 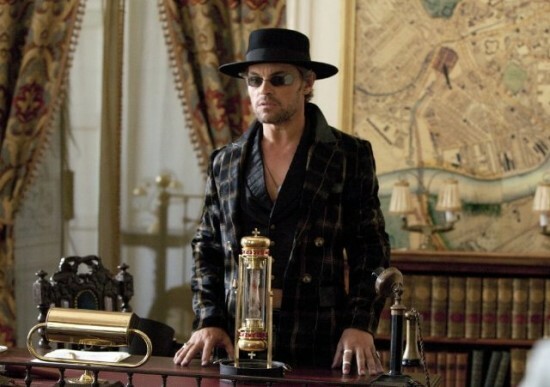 The best seer available arrives in town to help search out Dracula and all of his nests of vampires. He brings a major Christian relic, the blood of Christ. This will help him snuff out the locations of all of the vampires in town. The seer finds a nest right away, and hunters are dispatched and kill two vampires. After two days in hiding, Harker finally returns to work, confessing to Grayson that he murdered Lord Davenport. Grayson doesn’t let on that he already knew, and urges Harker to carry on as usual as best he can. Harker walks away smirking, letting us know that a plan has been set off. Browning receives an urgent message and leaves Lady Wetherby in the middle of their operation. Harker brings photographers from the newspaper to take some pictures for a feature article. Grayson tells Renfield to find out what is taking Van Helsing so long. Van Helsing is in his lab burning papers and smashing bottles. It looks like he’s destroying Grayson’s day walking potion. Renfield finds Van Helsing and demands to know what happened. Van Helsing makes up a story about hearing a noise and finding the lab in disarray, but it is all a ruse. Van Helsing stabs Renfield, telling him Grayson will never walk again in daylight, and the same will go for Renfield, who lays on the floor dying. One of Harker’s “cameramen” is tinkering with the resonator when Kowalski comes in. They manage to go undetected, and make there way out. The man tells Harker that five minutes after the resonator is turned on, it will explode. Harker thought the machine was just going to malfunction. Harker goes looking for Mina, unable to find her at her house. He heads to the demonstration to find her. The seer tells Lady Wetherby that he sees Dracula speaking to a group of humans. She immediately realized that Grayson is Dracula. The seer gives her a knife from the Papal Armory and she heads over to the demonstration. Van Helsing sent a ransom note to Browning’s wife, including one of his children’s fingers. Browning meets Van Helsing at an old barn with the ransom. Van Helsing finds his gun, and takes it from him. Browning doesn’t remember killing Van Helsing’s family saying something along the lines of “well that doesn’t exactly narrow it down”. Van Helsing reveals to Browning that he was the one who released Dracula back into society. Van Helsing releases a trap door, and Browning falls down to a lower floor. Browning’s children come out of the dark. He urges them to come to him, and they reveal themselves to be vampires, and they start feasting on Browning. Van Helsing yells down that he fed them Dracula’s blood. He then covers the barn in gasoline and sets it on fire. Mina and Grayson lock eyes during his speech, just as Harker finds her. He tells her the resonator is rigged to blow up, and tries to lead her away. Harker pushes past a man who responds by knocking out Harker with one punch. Mina rushes to tell Grayson that the resonator is rigged. Harker comes to and tells Grayson that they reversed the wiring. Grayson tells Harker to get Mina to safety, and they rush off as Grayson tries to fix the resonator. Everyone is rushing away from the demonstration site as the bomb goes off, with Grayson still inside the building. Bodies are strewn all over the streets as Mina and Harker awake. Mina calls Harker and murderer and goes to look for Grayson. Harker looks down and sees one of his friends from the newspaper dead in the rubble. Lady Wetherby arrives at the bombsite and is looking for Grayson. She knows he is still alive. Grayson comes out of the darkness, looking none the worse for wear. They have a pretty sweet fist fight, before Lady Wetherby stabs him with the Papal sword. Grayson goes down, only to leap back up and throw Lady Wetherby onto a metal post. He says that he has grown immune to all of her toys. Lady Wetherby tells Grayson that he can never be what Mina needs. She also tells him not to turn her, as he owes her that much. Grayson attacks her and drinks from her, but he does not turn her, letting her die. Lucy awakens, and calls for her mother to comfort her. We all saw this coming from three and a half miles away, and Lucy kills her mother. I must say, in the minute and a half that Lucy was a vampire, she was much more interesting than when she was just Mina’s rich friend. Mina is at Grayson’s house looking for him (why she didn’t look for him at the bomb site we’ll never know). She sees the painting of Grayson’s first wife that looks just like her. Grayson tells Mina that he’s been in love with Ilona for as long as he can remember, and that he fell in love with Mina the minute he laid eyes on her. He can’t explain why she looks like his “past life” love, but nonetheless they embrace and make their way to the bedroom. Van Helsing is in his lab (the one he didn’t destroy) and pulls a box out from hiding. There is a bible and a bunch of crosses in the box. Is Van Helsing actually a vampire hunter? Harker arrives, and Van Helsing says he will tell Harker everything he needs to know in order to destroy Grayson. He tells him that Grayson’s name is Dracula, and that is where the first season comes to an end. The change that happened throughout this season is pretty amazing to me. What started out as business politics set in the 1800’s turned into a great vampire series. I hated this show when it first started, and I was actually looking forward to the season finale. So I think for the first time ever, I would tell people to suffer through the first two or three episodes before it gets really good.